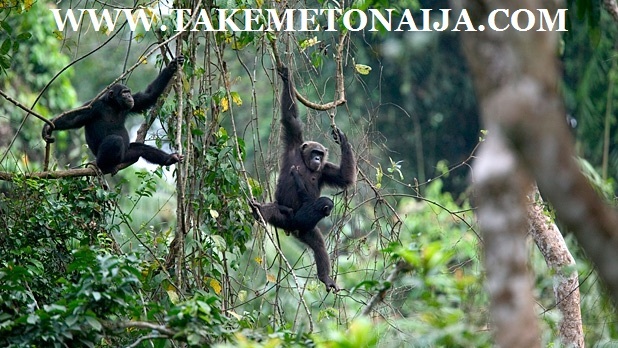 Afi Mountain Wildlife Sanctuary is located in the highlands of Cross River State Nigeria and it is under the management of the Cross River State Forestry Commission. The wildlife sanctuary is a home to rare chimpanzees, gorillas and drill monkeys. On Afi Mountain wild drill still survive with other endangered primates including the most endangered gorilla subspecies, the Cross River gorilla. The rugged massif (1400m) is a critical watershed for dozens of communities. Afi Mountain is listed as an IBA (Important Bird Area) for Nigeria and hosts one of the largest migratory swallow roosts in Africa. Looking north along the west side of the Afi massif above the Boje villages. The forests on Afi Mountain are a barrier against the encroaching derived savannah from the west and north. In 1993, Pandrillus started community protection patrols using local hunters to discourage shooting and trapping, an education programme in the 17 villages surrounding the mountain, and brought the communities together as a common interest group for the first time. Pandrillus community protection programme prevailed and made great strides in controlling hunting, in particular developing popular support for protection of “The Big Three” – gorilla, drill and chimpanzee. In May 2000 the state government legally created the Afi Mountain Wildlife Sanctuary from the northwest portion of the Afi River Forest Reserve – a production forest reserve for which logging concessions had been issued. Today the sanctuary is the best-protected area for drills in the world. The 1996 Whitley Award was awarded to Liza Gadsby for her work with the endangered drill primate of south-east Nigeria. Drills are a close relative of the mandrill baboon. With the unenviable status of being the IUCN’s highest conservation priority for African primates, these monkeys are highly endangered. At an alarming rate, extensive timber extraction, agriculture and hunting have led to the rapid degradation of the drills’ natural habitat in fragmented pockets of Nigerian and Cameroonian forests. At one time, the drill was thought to be extinct in Nigeria, until 1987 when Sandy Harcourt and Kelly Stewart carried out a survey and confirmed their continued existence. Surveys by Liza and Peter Jenkins in the following years showed that four small pockets of forest habitat did have surviving drill populations. Determined to stop the extinction of the drill, in 1991 Liza set up the first in-situ captive breeding and rehabilitation centre for any endangered primate in Africa in the mountainous Afi River Forest Reserve. Over 65 drillls have been recovered from the pet trade and rehabilitated to live with members of their own species in enclosures of up to 9 ha. In zoos, drills have reproduced poorly, but the Drill Rehab and Breeding Centre (DRBC) has recorded over 150 births to rehabilitated parents and their offspring, making the project the world’s most successful captive breeding program for an endangered primate. Very much a local initiative run by Liza and her partner Peter Jenkins, the centre has drawn the attention of the local community to the plight of the drills in the village of Buanchor. Many men from the village, most of whom were former hunters or involved in slash and burn activities, are now employed by the project to help carry out the education programme and anti-poaching patrols. The Centre’s educational programmes have been one of the most important parts of the project; protection of the mountain with its remaining habitat and wild drills ultimately rests with convincing the local population of the importance of the drills and other animals, and their habitats. In recognition of her long-standing work with primates, the American biologist has been compared to Jane Goodall and described as ‘the new Dianne Fossey’. When Liza won the Whitley Award in 1996, she and her partner had already completed eight years of work with drills in Nigeria. Previously, she had also undertaken gorilla surveys and worked as a veterinary assistant. In 1998, FFI joined the project, resulting in an effective partnership. WCS, the Nigerian Conservation Foundation and the Cross River State Commission have also collaborated with the project. FFI went on to receive funding from the Darwin Initiative, securing funding for Liza’s project for a further two years. Of these developments, Liza said ‘This is a far cry from our community ranger days and I am proud that those first brave efforts have developed into an official program’. In 2003, Liza received Continuation Funding from WFN in recognition of her ongoing work and in 2005 she went on to win the Chevron Conservation Award. Pandrillus, the NGO she established in 1988, is now well known nationally in Nigeria. Liza and Peter hope to launch the next exciting phase of the project – the release of rehabilitated drills back into the wild on Afi mountain – in 2006. The release will be combined with surveys of the remaining wild populations and post-release monitoring to assess the success and future priorities of the drill conservation initiative. Ubi Sam Ettah was Drill Ranch Manager for 10 years before accepting his current position as Conservation Coordinator for the sanctuary. TIN MAGAZINE HOPES TO VISIT SOON AND SHOW YOU A BETTER EXPERIENCE.